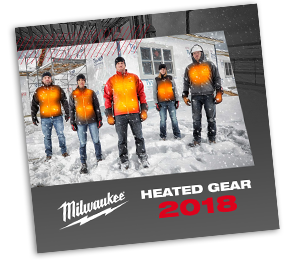 Born out of necessity on sub-zero commercial jobsites and developed by teams of advanced engineers, Milwaukee® Heated Gear combines patented Carbon Fiber Heating Technology with the power and durability of REDLITHIUM™ Batteries to battle extreme temperatures. Custom developed materials maximize durability and flexibility to outperform traditional fabrics against abrasion and tearing. High-wear zone reinforcement and trade-focused features maximize utility and extend product life. You don’t expect your tools to break down, neither should your gear. Reducing the need for bulky layers, Milwaukee® Heated Gear products utilize carbon fiber heating elements to generate and trap heat across core body areas. Adjustable heat technology allows users to adapt to changing conditions by increasing or decreasing the heat level with the touch of a button. Powered by REDLITHIUM™ CP2.0 Battery for extended run-time. Yes, I'd like to receive Milwaukee emails with information about new products, contests and more. Congratulations, Your 2018 Heated Gear Catalog will arrive in your inbox shortly. We experienced a technical difficulty while processing your request. Your request may not have been correctly sent.